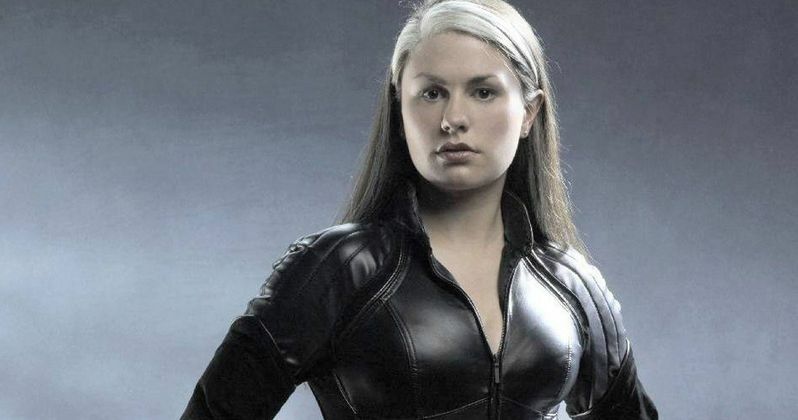 Fans will get to see much more of Anna Paquin's Rogue in the "Rogue Cut" of X-Men: Days of Future Past, which doesn't have a confirmed release date. We reported earlier this month that the Blu-ray and DVD release will have over 17 minutes of never-before-seen footage of Rogue, whose part in the film was cut substantially. With X-Men: Apocalypse starting production this month in Montreal, it isn't known if the actress will be back as Rogue, but she took to her Twitter page today to reveal that she would love to play Rogue again, if they give her character the power to fly. "if I get to fly, absolutely"
"no I'm saying that comic book rogue gets to fly and I never did. I want to be badass rogue not shy teen rogue"
We'll have to wait and see if Rogue will pop up in X-Men: Apocalypse, but it's also possible that she could also show up in next year's Gambit starring Channing Tatum as the title character. Another possibility is that Rogue could surface in Wolverine 3, given her longstanding relationship with Hugh Jackman's Logan from the original X-Men trilogy. As you may know, the entire franchise timeline was altered in last year's X-Men: Days of Future Past, but it's still possible that she could appear again in this new timeline. Would you like to see the actress come back as Rogue? Let us know what you think below.